Poly-Viscose Fabrics – blends for Suitings, Shirtings, Safari & Corduroy for domestic and overseas markets. Worsted Fabrics – Geoffrey Hammonds is the brand in this segment. It offers 100% Wool, Wool rich, Lycra blended Poly Wool, Poly Viscose, Mohair Polyester wool and Polyester silk wool. Furnishing and Fashion Fabric – This segment is divided into below parts – Natural Blends, Fiber dyed plains, Linen Plains, Poly Fabric, Silk and Silk blends. As per the Company website it shows to have Global presence. Almost all countries are shown as covered except few in Africa and Europe. If that is correct then Company has wide reach across the Globe. The amount of revenue from export will be interesting to note. The Company also has online shopping site present. It is an excellent step from the Company. Online shopping is growing at brisk rate. Any company having online presence to sell its product is good. 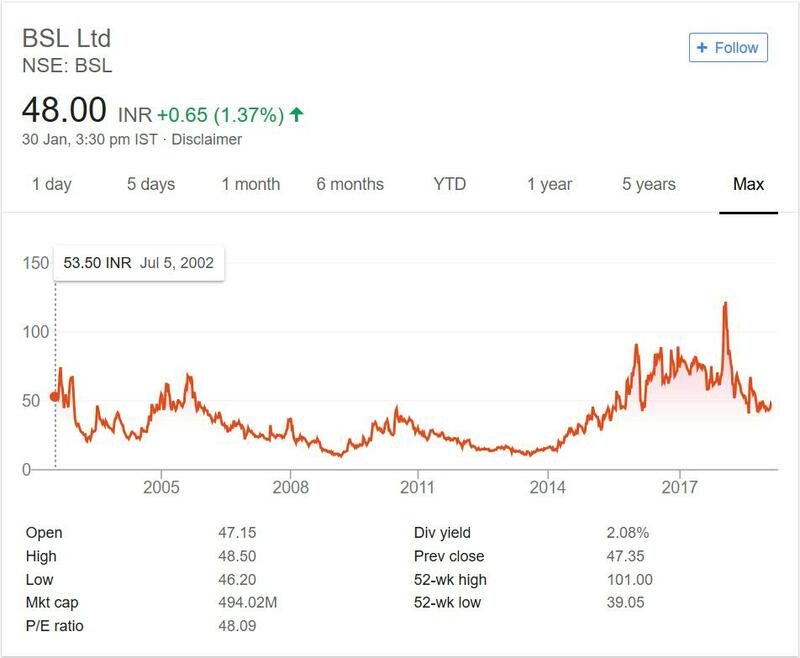 If you look at Stock price performance of BSL Limited for last 16 years it presents a sorry figure. The stock was trading at 50 mark in year 2002.It touches 50 mark again in year 2006. But thereafter it continued to decrease and till year 2016 never touched the 50 mark. For more than a decade the stock gave negative to 0 return if you sold at peak. This is not good for any Company. Moreover the next couple of years it touched 100 mark then again dived back to under 50 levels. So investors have not made any money in this counter for past 16 years. The dividend yield of 2% is attractive at current market price. But dividend alone should not be criteria to invest in a Company. You should take money growth in account as well. BSL Limited operates in Textile sector. This sector is one of the largest employer of work force in India. There are many companies listed in this sector. Textiles Industry has issues of its own as well. Personally I do not like Textiles sector due to NPA issues and competition in this sector. You will find small companies listed in it. I am more bullish on Textile machinery sector as it caters the entire industry. Note textiles as a industry is evergreen as demand for cloths will never decrease. The performance of Company over the years have proved my statement that Textiles industry has not performed. There are some exceptions but generally most textiles companies have not performed over the years.